Sir Michael Fay put together the three leading New Zealand designers and a $15,000,000 budget to realize the first long-lasting challenge for the America’s Cup. He first built KZ-3 and KZ-5 and tested them extensively, finally, he had KZ-7 built based on the test data acquired from her predecessors. Special attention was devoted to her keel design, she had an innovative deck layout and two cockpits. She was a good all-round boat, a bit longer and with more sheer than KZ-3 and KZ-5. During the 1987 Challenger Trials, skippered by Chris Dickson, she had an impressive series of wins but was eliminated by Dennis Conner’s Stars & Stripes ’87 by a score of 4-1. Stars & Stripes ’87 went on to win the 26th America’s Cup against Kookaburra III. 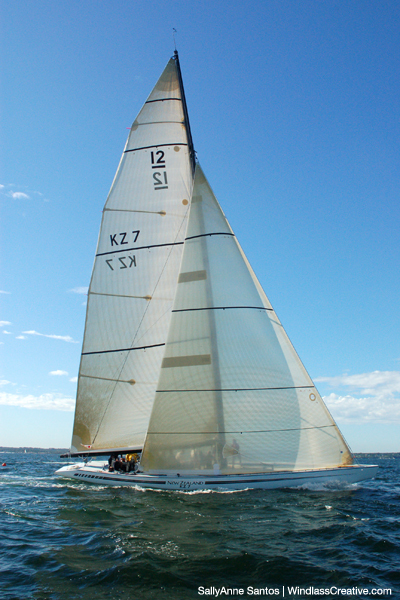 In 1994 she won the Sesquicentennial Regatta (NYYC), Newport. In the late ’90s she was leased for three years to Patrizio Bertelli who raced her in the Mediterranean circuit. In 1998, she won the St. Tropez Rolex Cup, in 1999 she finished sixth at the Twelve Metre World Championship held and took second at the 2000 St. Tropez Cup. Kiwi Magic returned to the U.S. and joined the Newport fleet. By 2006 she was owned and raced by Bill Koch. She is currently at the U.S. Merchant Marine Academy at King’s Point, NY.